Substance abuse can lead to distress or impairment of driving, create legal problems, result in failure to fulfill major work/school responsibilities, and lead to recurring personal/social problems. Effective prevention requires consistent, pervasive messages about alcohol and drugs. The main goal of substance abuse prevention is to delay the first use of alcohol and/or drugs. Research shows that adolescents who start drinking before age 14 years are more likely to be alcohol-dependent later on in life compared to people who do not drink before age 21 years. This is why delaying first use of drugs/alcohol is an important part of prevention. However, proactive parenting and strong family bonds will help delay youth experimentation with drugs later on. When considering a prevention campaign, it is important to give attention to multiple risk factors. Reducing risks factors can reduce problems in school, peer groups, and community. Protective factors should be increased, such as healthy development in all life areas. You’ve heard it said, “It takes a village to raise a child.” Well, with alcohol and drug prevention, it takes a village to prevent substance abuse. Responsibility for prevention belongs to peer-mentoring groups, leadership programs, schools, and churches. Peer-mentoring is a powerful preventive force, and it demonstrates the benefits of prevention with youth as prevention partners. Communities can put out prevention messages in an effort to deter use/abuse. Stick to your treatment plan – Monitor urges and cravings, attend support groups, see your counselor, and take your prescribed medications. Avoid high-risk situations – Don’t go back to people who use drugs or sell drugs. Get help immediately – As soon as you have the urge to use again, seek inpatient or outpatient treatment. Family history of addiction – Addiction is more common among people who have a genetic predisposition. If you have a parent or grandparent with addiction problems, you are at greater risk. Being male – Men are more likely to abuse drugs and/or alcohol than women. However, for females, addictive disorders progress more rapidly. Peer pressure – This is a strong factor for drug use/abuse. Lack of family involvement – Certain family situations or lack of bond with parents increase a person’s risk of addiction. Having another mental health disorder – These problems include depression, post-traumatic stress disorder, and attention-deficit hyperactivity disorder (ADHD). Using drugs is often a way of coping with painful psychological feelings. 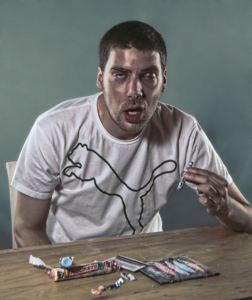 Taking addictive drugs – These include prescription drugs such as painkillers and stimulants.